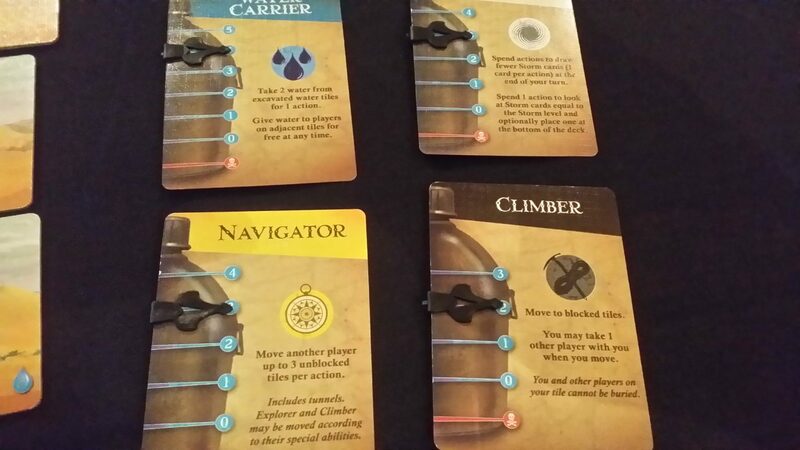 Our expedition has not gone well. I fear we will not survive this ordeal. We were all so excited by the expedition. The ancient city of Meepopolis was something out of legend – we’d all read the tales of how its intricately carved dice towers would dominate the landscape for miles around. We’d seen the artistic renditions of the massive pyramids, built with unfathomable skill from multi-coloured cubes. It was a magnificent city, containing a million meeple at its height. And then one day, it was simply swallowed by the desert. And then last year, the desert storms blew away the sands of centuries revealing it to the world. The winds whispered a seductive promise – there is wisdom to be found here. And treasure. Oh yes, and treasure. It was a centre of learning, of weird experimental flying devices, and of glittering halls leading to endless rooms of glistening, twinkling victory points. How could we say no? We should have said no. We should have understood. Meepopolis was arrogant, cruel and haughty – driven by desire and greed. And so were we. Meepopolis was punished by the gods for its arrogance. It was buried for millennia underneath the uncaring sands of the desert. Its pristine cardboard streets were hidden from the world above for aeons. 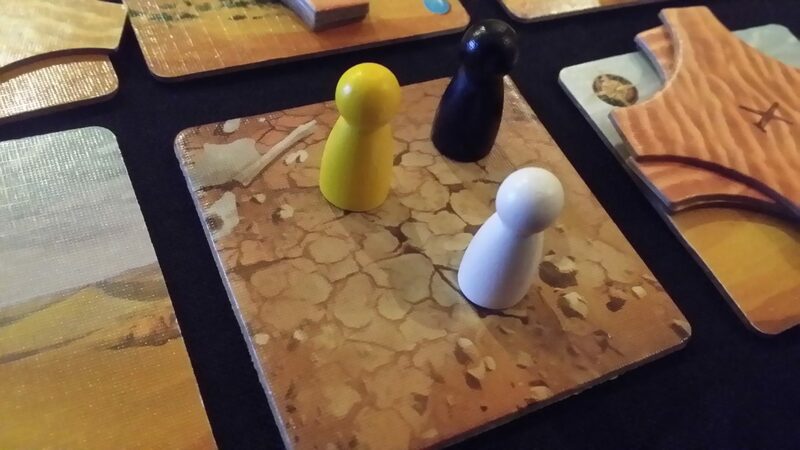 I never realised before today just how terrifying that must have been for the meeple that suffered that fate. Now, it’s all I can think about because it’s the fate we have wrought for ourselves. I can hear the storm all around us – I’ve never seen nor heard anything like it. I did not believe in the vengeance of the Gods before today. I do now. 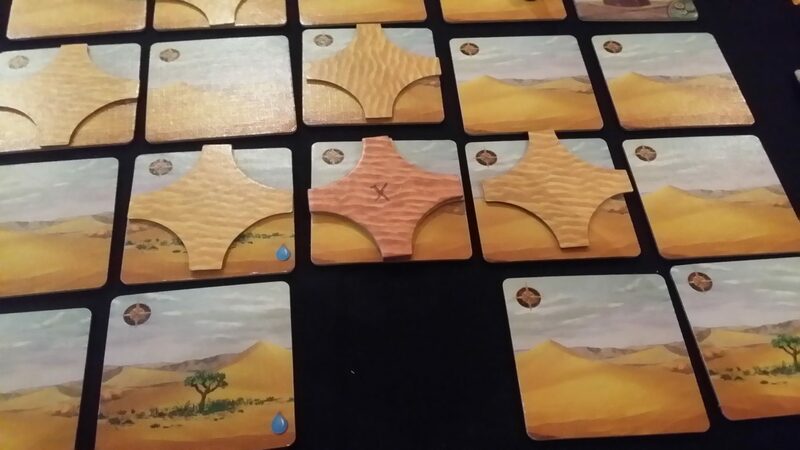 This truly is a forbidden desert, and we will die here as victims of our own hubris. 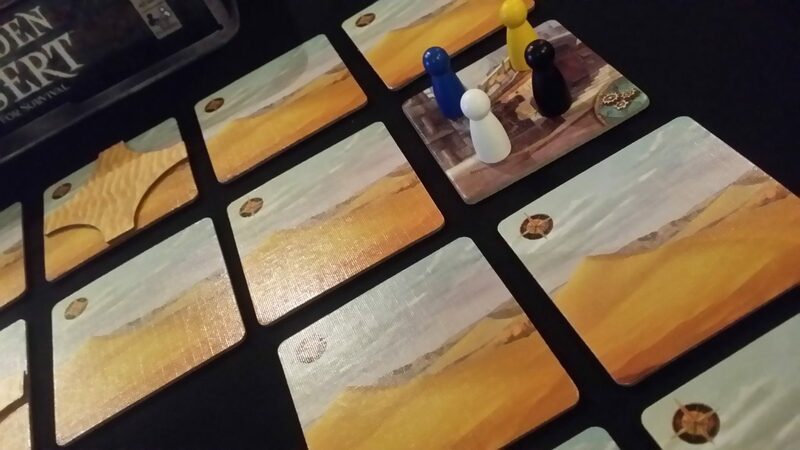 If you’ve read our Pandemic review, you’ll be starting with a fair idea of what it’s like to play Forbidden Desert. In many ways it’s ‘Diet Pandemic’. 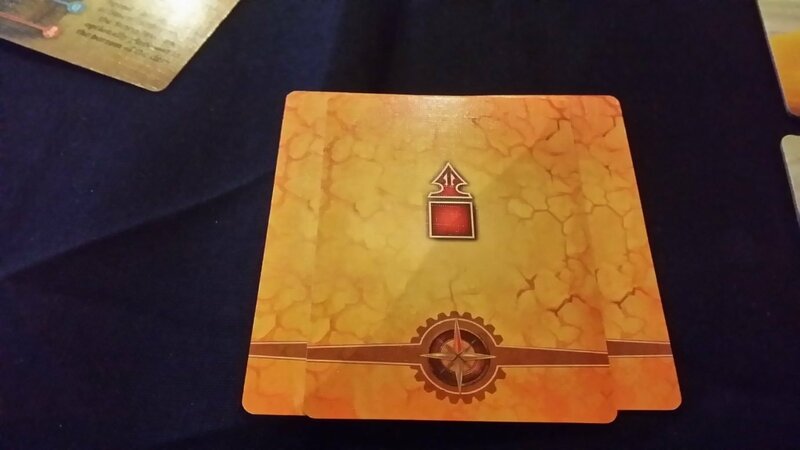 You can draw a straight line between Forbidden Island, Forbidden Desert, and Pandemic and locate each along the continuum. 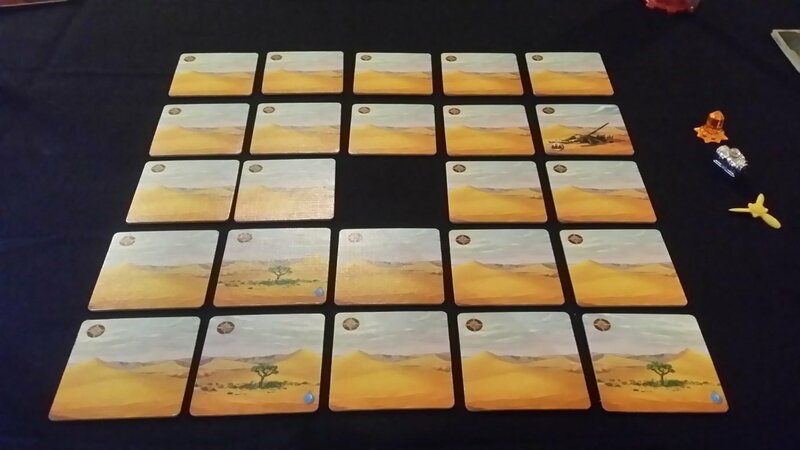 Forbidden Desert sits neatly in the middle of that line – not as complex as Pandemic but more complex than Forbidden Island. All three of these are Matt Leacock games, and the parentage shows. 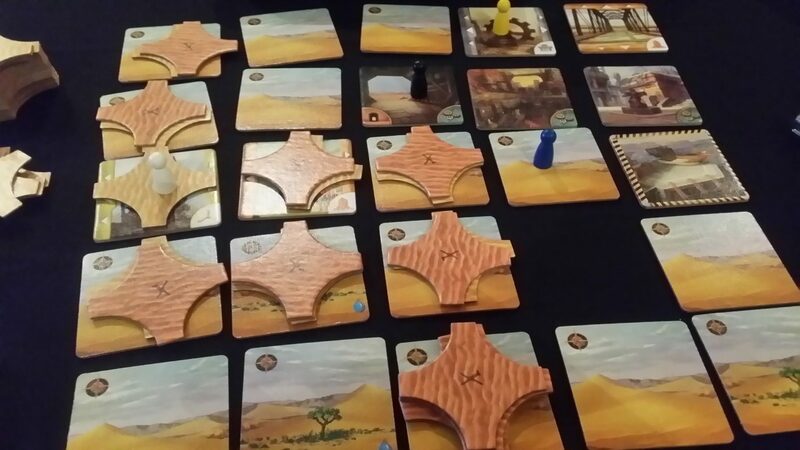 Forbidden Desert is a co-operative gave for between two and five players. We play the part of adventurers who were on their way to recover an amazing flying machine that was powered by pure sunlight. On the way, their helicopter crashes into the unforgiving sands of the desert – it’s broken beyond all hope of repair. The only possibility of escape lies in finding the various parts of the flying machine, and using them to get out of the desert alive. But here’s the thing – everybody makes it out, or nobody makes it out. 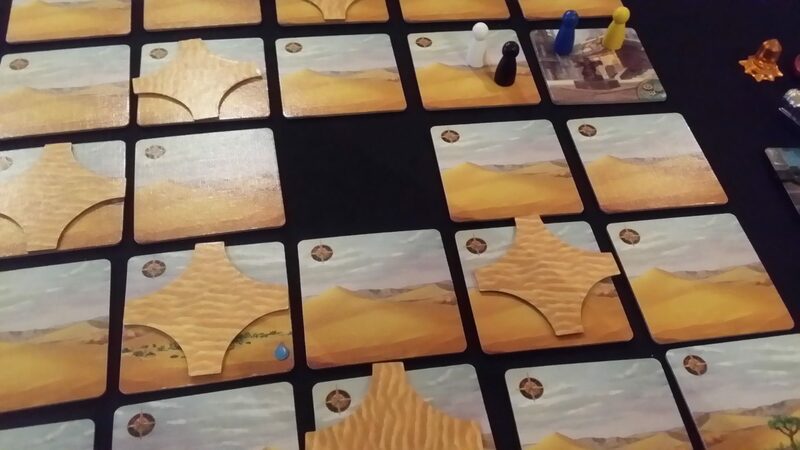 There are no prizes for partial success in this desert. This is how my car came back after I took it to Angus Tyres in Brechin. The first thing you notice when opening up the box (I say box – it’s a tin really. It feels really nice and classy as a product) is that it’s almost decadently luxurious in what it gives you for the price. 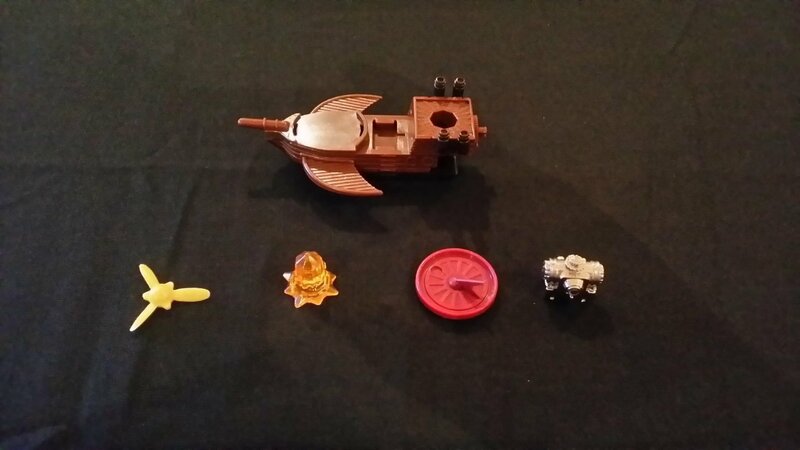 You’re not collecting cards, you’re actually picking up parts of an miniature flying machine. Sure, they’re not beautiful in and of themselves, but they are very thematic. The engine in particular is a solid piece of cast metal that feels really substantial. They all slot into place in the flying machine, so at the end you know what you’re trying to accomplish. Each time you pick up a piece, you can feel it in your hand. You can slot it into the miniature, and it is this that tells you how far you are from survival, or from death. To build the machine we need to find the four pieces of the device and get them to the launch-pad. That’s going to need us to excavate the city – just because we landed there, it doesn’t mean we can see anything that lies underneath its miles of featureless landscape. But that’s not all – we’re also bang in the middle of a phenomenally powerful desert storm, one that can disorient, throw us off-track, block our passage, bury us alive, or hide parts of the city under growing mounds of desert sand. 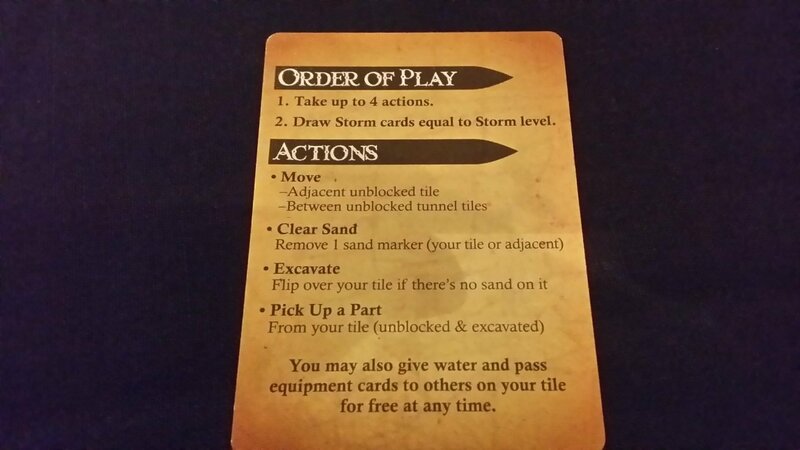 Every time a player finishes a turn, we work our way through the ominous storm deck. The big deck is the storm. The little deck is your equipment. More bad than good, like always in life. BUT THAT’S NOT ALL. We also have a time limit, because the desert is hot and we are so very thirsty. 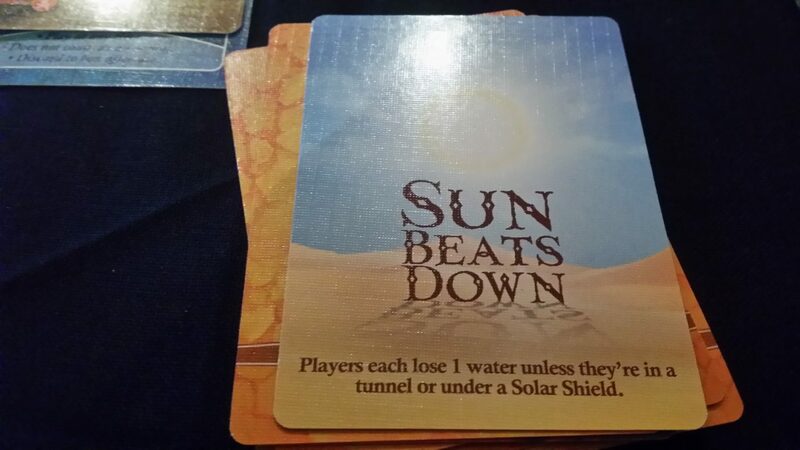 Each of our players has a water supply, and when that reaches zero they’re dead. When they’re dead, everyone is dead. The sun beats down relentlessly on this desert, and beats us down with it. 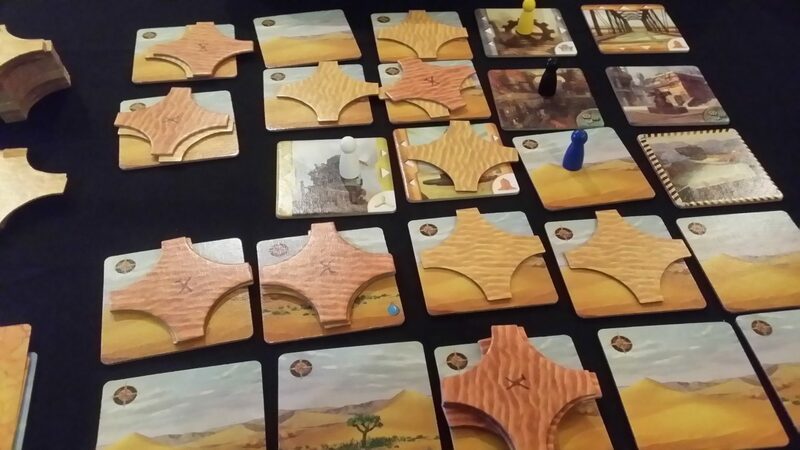 The desert is made up of tiles. These are shuffled, and then spread out over a table in a 5×5 grid, leaving the centre un-allocated. The centre is the storm – we can’t enter that, and it’ll move around as we explore the buried city. We’re going to hate and fear that moving gap in the desert, because it’s going to make our lives much, much harder with every passing turn. It sometimes seems to be imbued with a kind of malevolent intention – how else to explain its passage in exactly the ways that are going to screw us up the most? 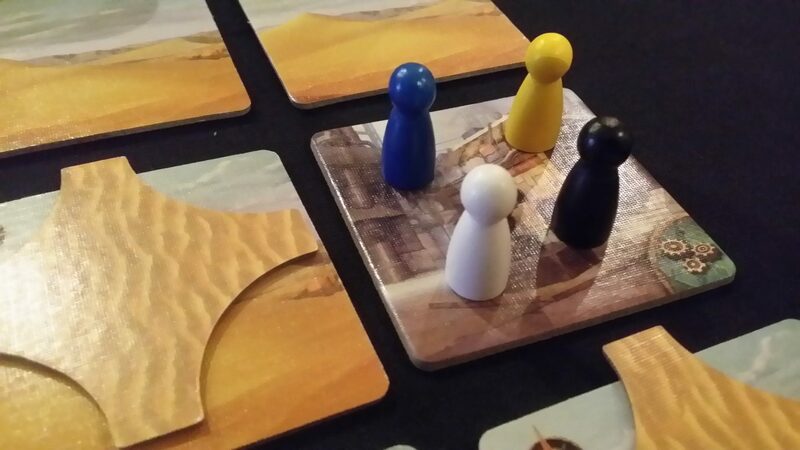 We also set up the desert with some sand spread around – sand means that we can’t excavate a tile, and if there are two or more sand markers on a tile it means it’s ‘blocked’ and we can’t move to it until we’ve cleared it back down to one. 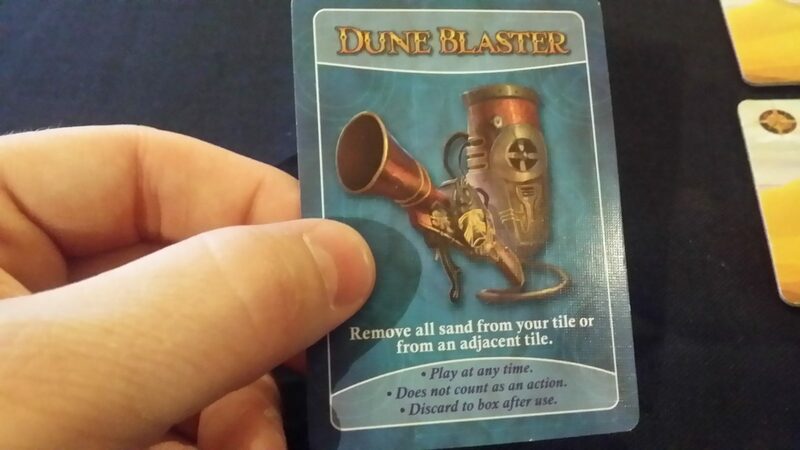 It doesn’t look like there’s a lot of sand there. That’s true. There’s going to be more as the game goes on. 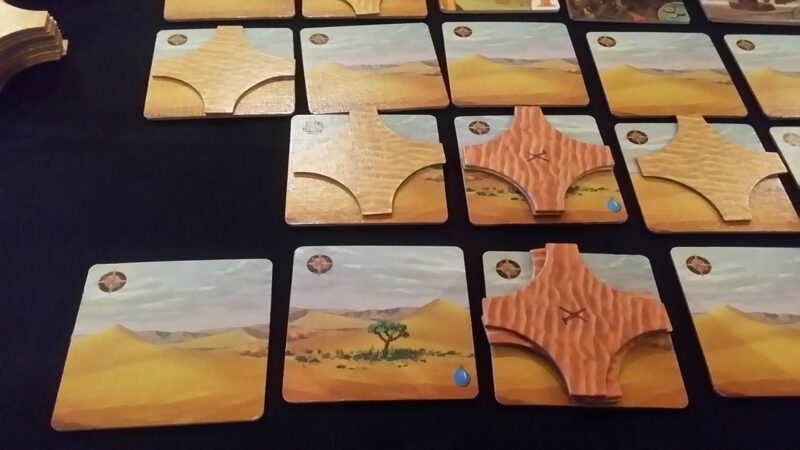 Soon, you’ll be looking upon this desert as the halcyon golden days of Forbidden Desert. You’ll remember your carefree days frolicking about its dunes. These are the good times. There are six roles that players can take. Each has its own special power. The climber for example can move over ‘blocked’ tiles (we’ll come back to that). The explorer can move and clear diagonally (we’ll come back to that too). The water carrier can take water from oases even when no-one else can (we’ll come back to that also). 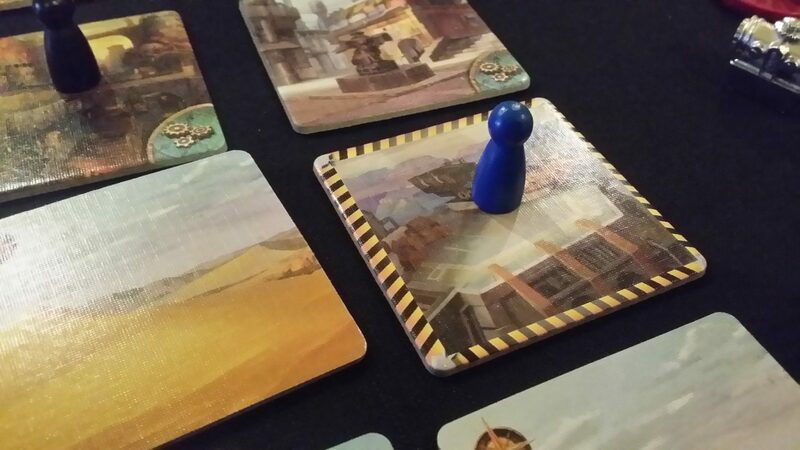 You get dealt your roles randomly – and as with Pandemic, some of these are definitely more useful than others. Once you’ve gotten your roles, your pawns are all placed on the helicopter crash site, and the game begins. 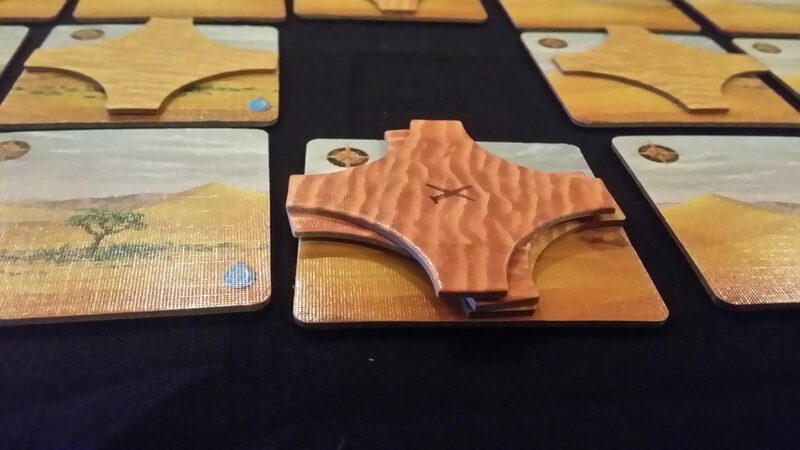 Starting with the player that is the thirstiest (or whatever way you want to determine first player status), the player decides on how to spend the four actions they are permitted per round. Here’s your menu. We have a special on despair today. Pawns can move north, south, east and west or between unblocked tunnels. 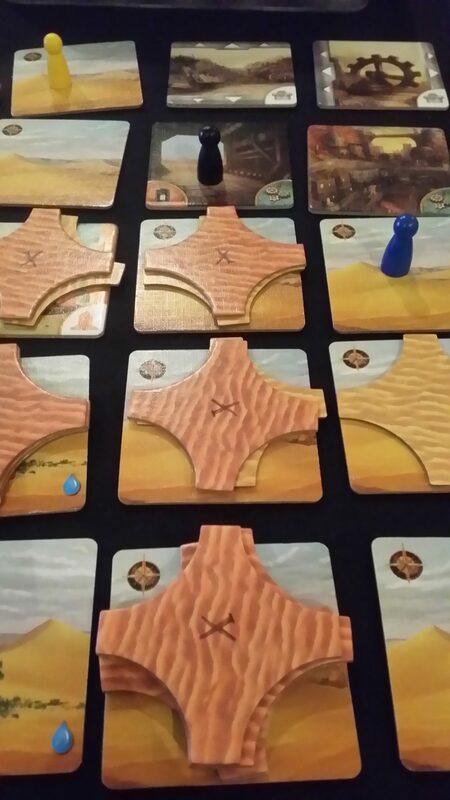 They can clear sand in adjacent tiles (again, only the cardinal directions). They can excavate their current tile if there no sand on it, and they can pick up a flying machine part if there’s on their square. 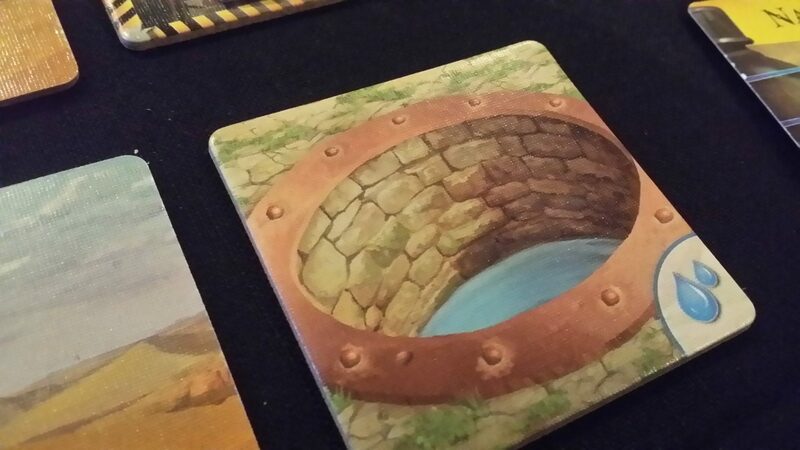 They can also freely share water and equipment, but that’s not something limited to their turn – just their tiles. Once those four actions have been executed, we look at what the storm does. Pick those four actions well, because the storm is gonna getcha. Our situation is dire, but I have hope. We had water in the helicopter, and we were able to recover many of our supplies from the crash site. That’s good, because it’s all we could recover – the helicopter will never fly again. It’s already been claimed by the desert. She is hungry, and we can hear her stomach rumble in the storm that rages all around. We have though come up with a plan. We will find the legendary flying machine that the scrolls spoke us. We will get it working, and we will fly out of this hellhole and back into society. It is a crazy, impossible plan. The plan of fools. The plan of those too cowardly to accept the inevitable approach of their own termination. It is our only plan. The desert is large, and we are few, so we have resolved to take our own individual paths through the buried city and seek the parts of the machine. We will need to work together, but we cannot travel together – the task is great, and our time is short. It is night now, and the dark of the desert is deep and intense. I cannot see my own hand in front of my face. Devoid of my vision, all I can do is think about the future. That brings nothing but trepidation. I will not sleep again until I leave this cursed place. As our water supplies dwindle, we’ll move these down a notch at a time. When the marker reaches zero, the game is lost. We’re going to begin our game with the climber (the black pawn). Her first action is to excavate the crash site. Equipment is hugely important – you can use it at any time, and it doesn’t count as an action – it’s a one use ‘get out of trouble free’ card. This one we can point at a stack of sand and just blast it away – it doesn’t matter how much is there, it’s just gone. And for her fourth, she moves to the west. But she’s the climber, so she can also take another pawn with her (with consent). She brings player two to give them a head start on the next part of the adventure. I need to talk to you in private. Let’s leave the other two to die. 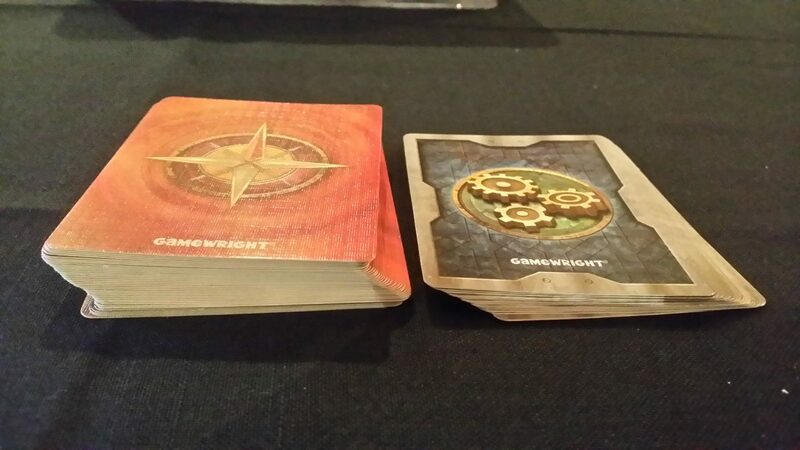 Each turn, we draw three cards from the deck. If we’d started it off as novice we’d draw two. 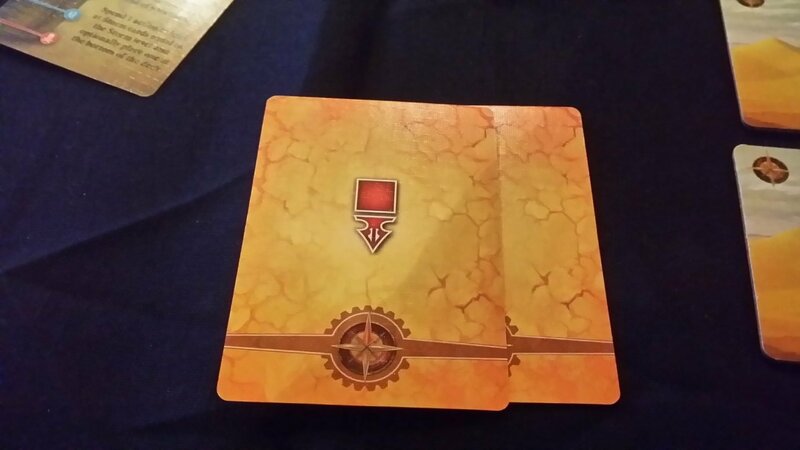 As the storm rages, we’ll draw cards that cause it to intensify – we can go all the way up to six cards being drawn. When we would hit seven, we die instead – the storm has ceased to be survivable. For now, we’re drawing three because this is our golden age. 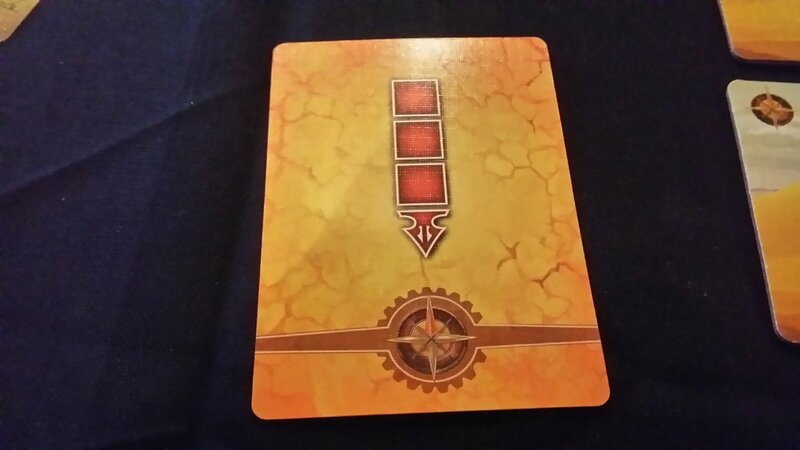 We draw the first card, and it’s an instruction for the storm – move three spaces south. 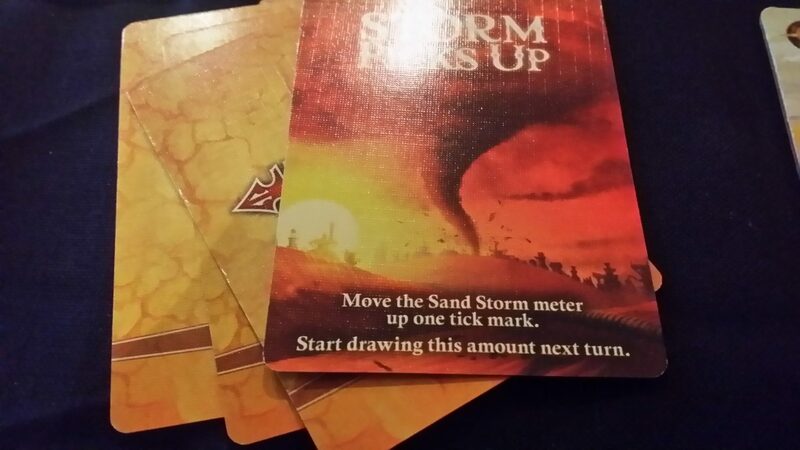 This means that we move the cards south of the storm up one, each time placing a new sand marker on them. If we add a second or subsequent marker, we add it with the ‘X’ side showing to indicate that it’s blocked. And then again – note that the square we just moved has an X on it – nobody (except for the climber) can move into that square while the X is showing. It reaches the edge – some force keeps it in the city. It can’t move south again, so it stays where it is – that’s termed getting ‘respite from the storm’. That was one card. We have two more to draw. More respite! We would move the storm one south, but we can’t. So we just ignore that one. Finally, something goes our way on this voyage. Yeah, it’s definitely petering out. That last tile square has taken a bit of a battering in the storm – it’ll need to be cleared twice before anyone other than the climber can enter it. 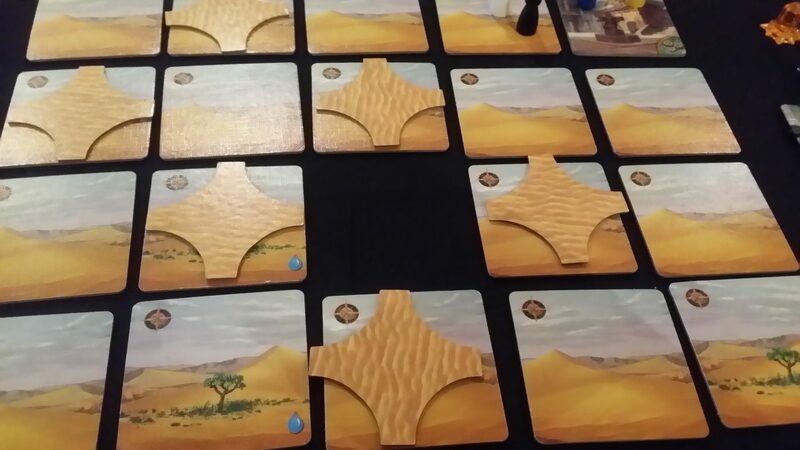 There’s no limit to how much sand can be stacked on a single tile, which may give you a hint as to what the game begins to look like in later stages. 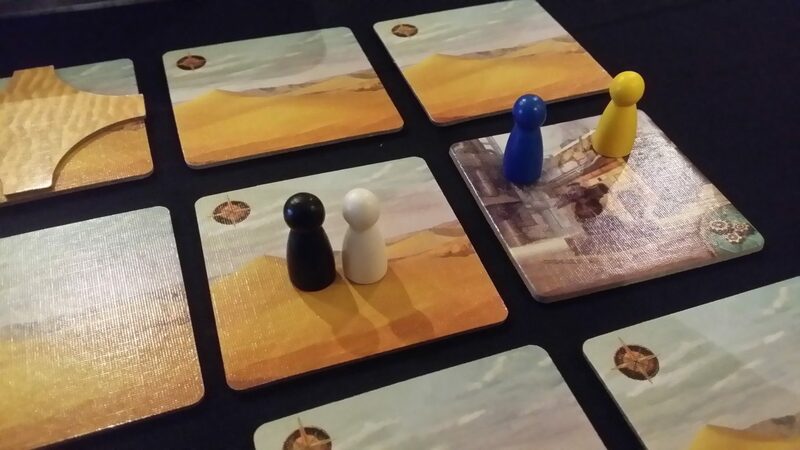 If we run out of sand markers to place, then the team has been buried alive in the desert and the game ends. The storm is safely off to the south for now, so our meteorologist excavates the tile he’s on to receive a piece of equipment. 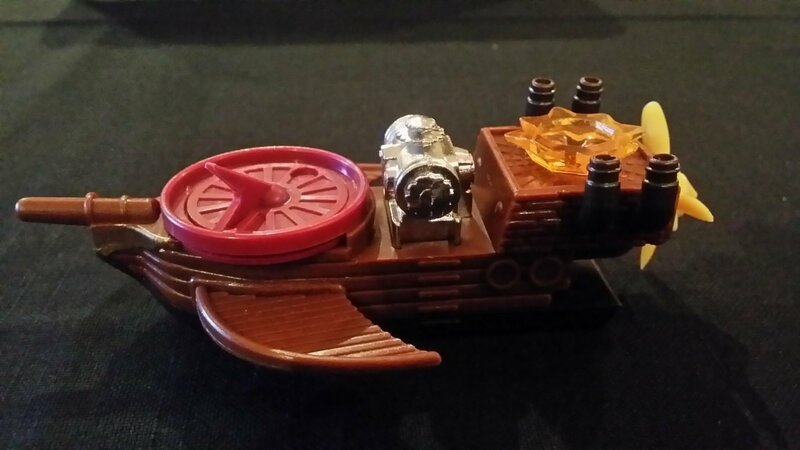 He then moves to the west (his second action), and excavates to reveal a clue to one of the flying machine parts! 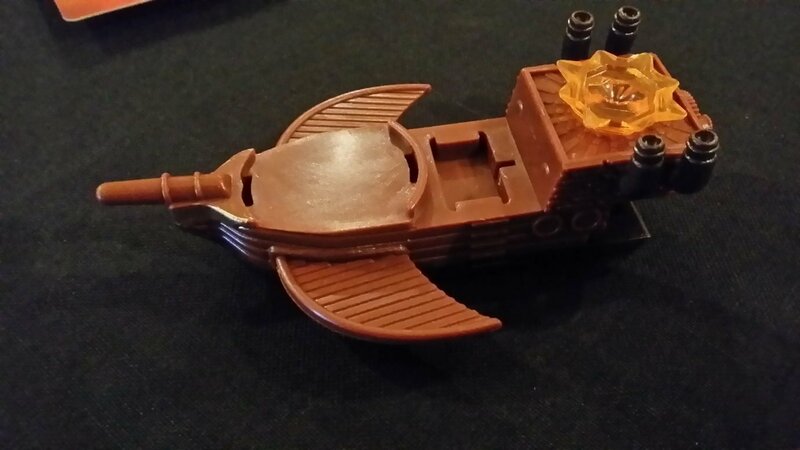 We have found evidence of the flying machine! We had believed our plan to be foolish, that it was just wishful thinking that had led us to believe there was a chance it might actually exist! Our efforts may not be in vain – I know not whether it works, or whether we can find all the parts of it before the storm takes us all, but I have hope now that I may not die in this wretched hellscape. I wonder though if that might not be the cruellest thing of all – despair brings a certain tranquillity. All hope has brought me is the agony of uncertainty. Do I dare dream that I will see my family again? I do not know. But I dream anyway. Every time we draw this card, the storm picks up. We need to move the storm intensity marker up by one. We’re still drawing three cards, but the next time the storm picks up we’re on four. That’s a lot of storm. We still have another storm card to draw, and it sends the storm back the way it just came – two to the east. 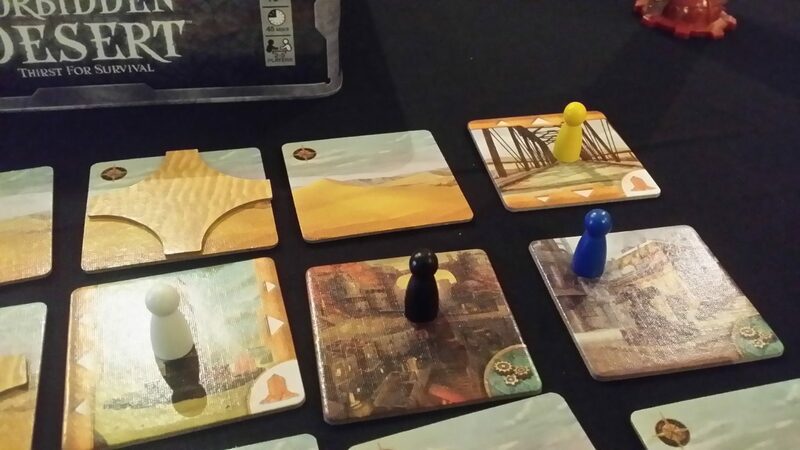 Player three heads north, excavates, and reveals another tile. It’s the column clue for the orange part of the machine! I know where it is! Everything is awesome! Where the column and row intersect is where we place the piece – any of our players can now pick that up for a single action. We’ll leave it for the fourth player since they’re already in the right location. Who would have thought it? This is going to be easy! This is going to be easy! We have already found a significant part of the machine – an odd, glowing crystal that we assume is some kind of ancient sun-collector device. It throbs with energy – this is an archaeologically significant find. There were always legends that the people of Meepopolis had a power source of unearthly potency, perhaps this is it! Like the orichalcum of Plato’s Atlantis, this has been the stuff of myth and legend. And now, we have it in our hands. I do believe we will survive now – and with riches untold to show the world! What I hold in my hands now is simultaneously the past, and the future. 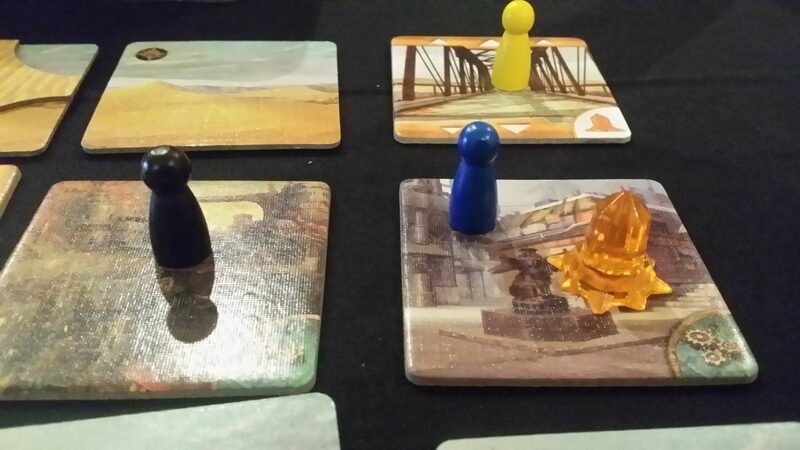 With actions three and four, our third player moves and excavates, to reveal the row marker of another piece! Man, and this is supposed to be hard? Feeling pretty good with that turn, the team look to the storm deck. Luckily I have a few boxes of delicious Pepsi Max when the water runs out. Hardly a big deal though, right? They’ve all got plenty left. Still plenty of reasons to be cheerful! There’s some more storm movement, and then the storm picks up once more. Okay, now we’re on four cards per storm turn. That’s not great, but this has been easy so far so maybe we need the extra challenge. 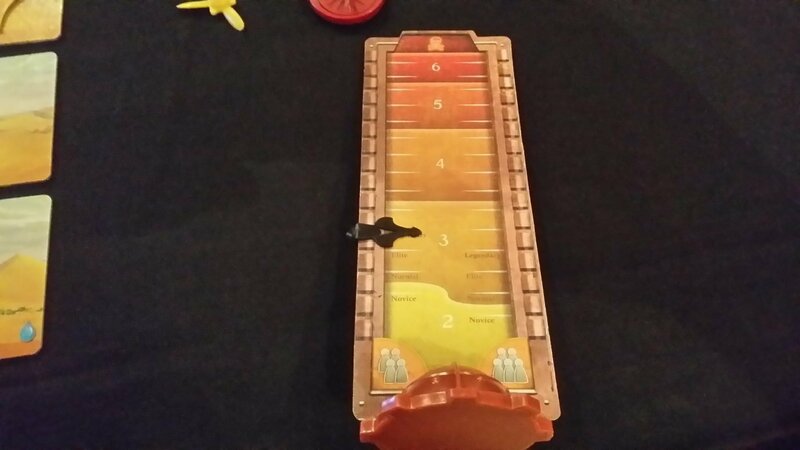 On her turn, player four picks up the orange part and it’s placed in the flying machine. One of the four pieces. We’ve basically won already. Buried for millenia and there are still delays on leaving. What? Didn’t we just do that? We sure did. And now we’re doing it again. Everyone loses a mouthful of water from their canteen. Still, it’s fine, right? It has to happen twice more before our climber dies, and three times more for the meteorologist and the navigator. And we have the water carrier, who is still laden with precious life-giving h20. It’s going to be fine! It’s going to be fine! We found more evidence of the machine, and we found the launch-pad. The sun is so relentless that we are going through our water more quickly than I would like, but I know there are at least three oases that we could resupply from. We will need to make a journey to the nearest one to refill our canteens before the sun kills us. However, one suspects that only a little water may be available after all this time – we will not be able to slake our thirst completely, and we will likely need to co-ordinate to ensure that we do not waste our opportunity. The sun is merciless, and I fear it will boil the water from the oasis if we let it. There’s some more storm movement, and it moves over our meteorologist, who really should have seen this coming. He’s now buried – he’ll need to dig himself out down to a single sand marker before he can do anything else. I’ll be shaking sand out of my crannies for weeks. I said it was fine, and it remains fine. IT’S FINE. There’s a lot of sand about, actually. When did that happen? 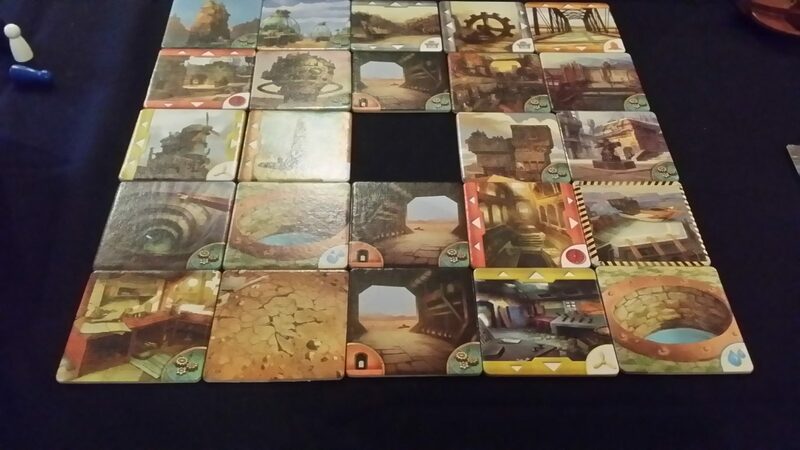 That’s a lot of work needed to excavate some of these tiles, and one of those tiles under a lot of sand is an oasis. Hrm. Sure, the bit we’ve been excavating is pretty clear, but that’s not the bit we need – we need to be making our way into the parts of the desert that the storm has been battering. Never mind, we can make good progress I’m sure. Our climber begins by clearing to the west (twice) moving and excavating. And she finds a tunnel! Tunnels are great – if you’re in a tunnel, the sun doesn’t impact on you when it beats down. And if you have another uncleared tunnel elsewhere in the desert you can move directly to that as if it were adjacent. We don’t, but at least our climber doesn’t have to worry about dying of dehydration just yet! Yeah. It’s not fine, is it? God, that’s a lot of sand. God, that’s a lot of sand. We have been so focused on our task that we haven’t been paying attention to what the storm has been doing. Now that our expedition must make its way into the south and west of the city, I’m starting to see the difficulty of the task. I remain confident, but sand has blocked our way to one oasis, and the other is far out of the way and inconvenient. We need to make our way into the southwest of the city anyway, so we will clear our way to the oasis and make use of it before we complete our labours. We have still uncovered evidence as to the parts we need – we are still confident we will survive this ordeal, and come out of it richer and more famous than we could ever believe. We will be as Gods – real-life Indiana Joneses draped in wealth and prestige. It is what keeps me going during these long, arduous days. And the sun beats down still. I fear it shall drive me insane before I make it home. Oh yes, my family. I would also like to see my family again. Our climber is in a tunnel, so it doesn’t impact on her. But now we have three adventurers that are two days in the sun away from death. It’s time to make our way to the oasis. We go for the one that’s surrounded by sand, because the other one is away in a corner and we don’t have that kind of time to waste. The other is buried. We need to clear the southwest of the desert anyway, because we’re still hunting for clues and that’s where statistically we’re most likely to find them. She’ll jump over them like she’s Mario. For anyone else, that’s a nightmare. She can climb over blocked tiles though, so moves south three times and then west to land on the oasis tile. She’ll need to wait though – you only get one use of an oasis, and if you’re not on it at the time it’s revealed you don’t get anything. We need at least the three adventurers with the least water to make their way there before it’s flipped over. All we wanted to do was rob a site of immeasurable historical value for its priceless relics. WHAT DID WE DO TO DESERVE THIS? If the sun beats down one more time, we have three deaths on our consciences – and remember, one death is a failure state. We need to get to that oasis! That is now priority number one, and we’ll do everything we can to make it happen. Pull out all the stops, this just has to happen right now. 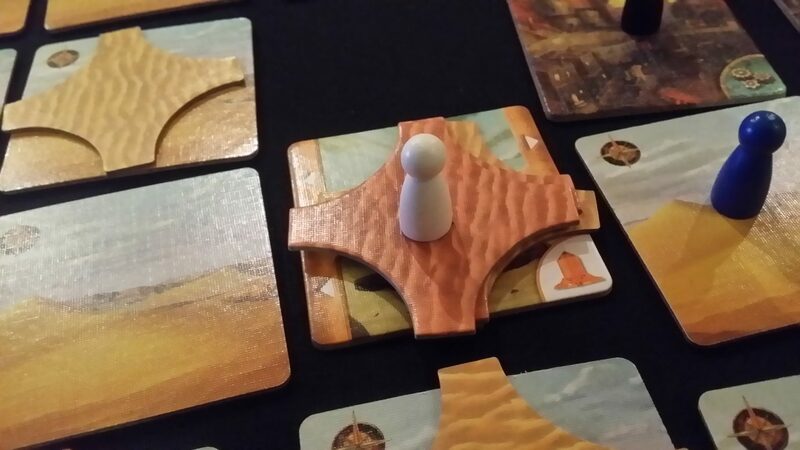 Taking advantage of a relatively light dusting of sand on the western side of the desert, our meteorologist manages to make it to the square without too much trouble. That’s two! But the storm is raging, and the sun can beat down at any time. Luckily, it doesn’t. Our blue player is able to move south twice, but is then blocked to the west. Blue isn’t an emergency though, and the water carrier ability is to be able to take water from an oasis at any time. So that’s not a deal breaker. But what about yellow? Look how far away he is – that’s not possible. So I guess we’re going to die after all. It’ll need spectacular luck at this point. The storm rages, burying him. He clears, moves south, excavates. It’s equipment. It’s… A JETPACK? It was worth dying in the desert just for this. IT’S A JETPACK! We can go anywhere we want for no action points! So guess what we do? That was SO LUCKY. I fear this will be my final entry. What we took for an oasis was a mirage. A hateful, spiteful mirage – we found not water, but only dry, cracked sand that mirrored our dry, cracked lips. We saw another oasis on our way in, but it is now covered by the desert. The other is too far away for us to reach. Barring a miracle, we will die here. If any foolish soul should venture into this desert and find this journal, tell my wife that my last thoughts were of her, and our children. It is so hot. The sun beats down. It was so hot, I wished I were dead anyway. If we did, everyone on the square would get to fill their canteens up by two units. Not enough to be safe, but enough to survive. Instead all we found was cracked mud and the proof of our inevitable demise – of the three oases in the game, only two are real. 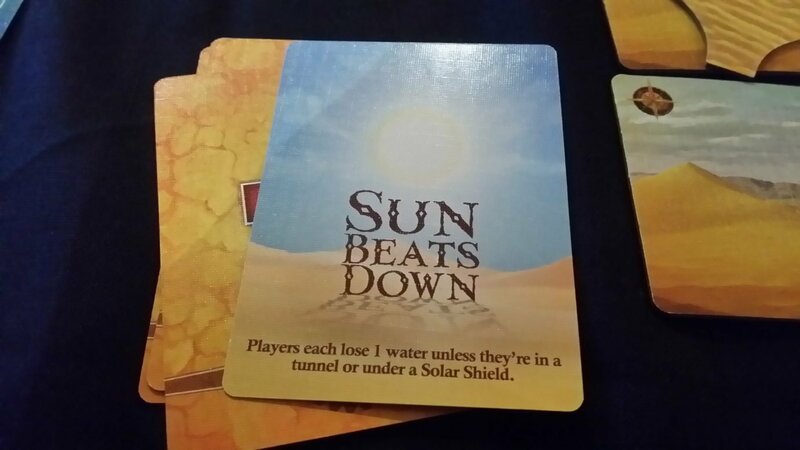 With the sun beating down card, we all lose another water, taking three of us into death. Death takes our game with us. MAYBE YOU SHOULD HAVE STUCK TO CHESS, he suggests. I’VE ALWAYS BEEN PARTIAL TO EXCLUSIVE POSSESSION, MYSELF. 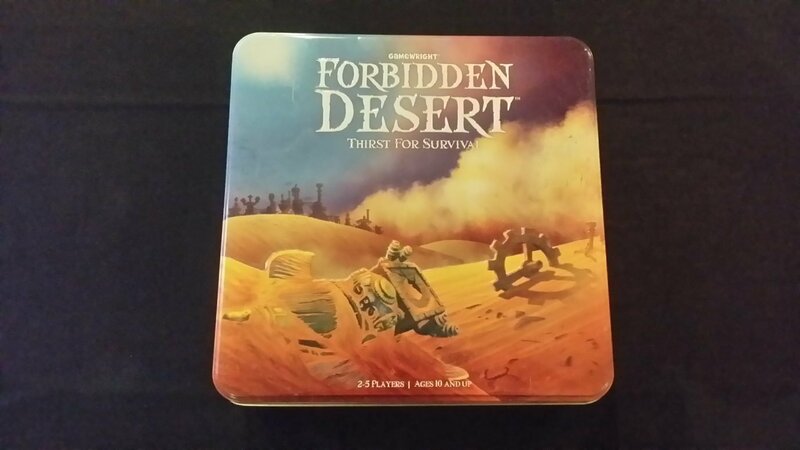 Like Pandemic, Forbidden Desert is a game that requires you to accept as you go in that you’re probably going to die in the desert. 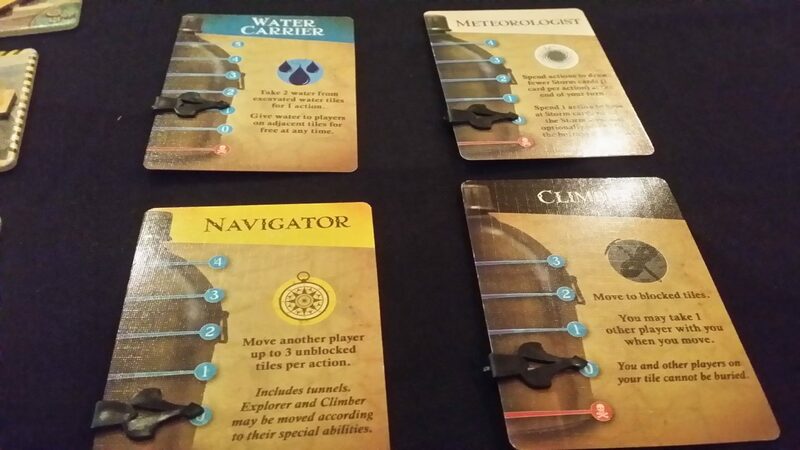 However, unlike Forbidden Island, which we’ll get to on Meeple Like Us eventually, it gives you a set of tools you can use to manage your inevitable failure. It never feels particularly arbitrary. It’s not like in Pandemic where a situation can spiral out of control on the flip of a single card. It’s far more incremental, and almost always comes down to our own mismanagement of resources. There is a tipping point when we go from ‘winning’ to ‘losing’, but if you look at the way the game was played up until that point you can see the direction of travel was well signposted. There are ways in which we can manage all of the problems we face if we have enough equipment. There’s extra water, solar shields, and devices that let you see under blocked tiles. Using those is important in making sure you don’t waste time – you don’t have a lot of it, after all. But not using them is important in making sure you can manage catastrophes – you’ll be overwhelmed otherwise. We’re balancing our resources versus time versus risk versus reward, and it’s very satisfying. This is the city in its hey-day. 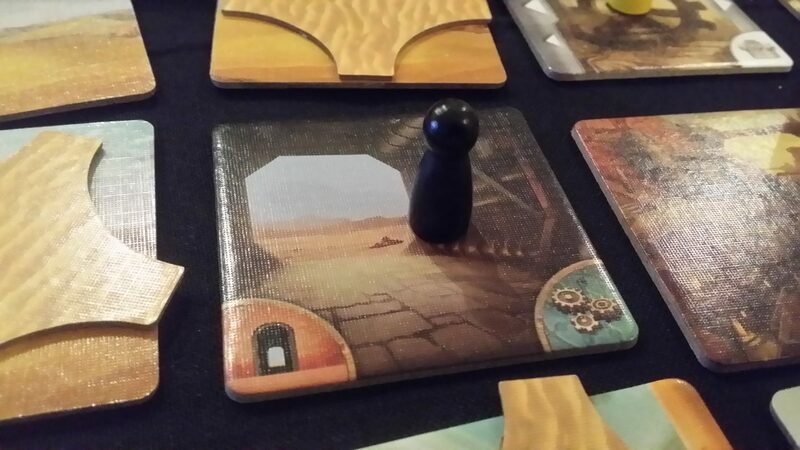 It’s a little bit of a shame that so much of the game has the tiles under bland and uninteresting sand markers. 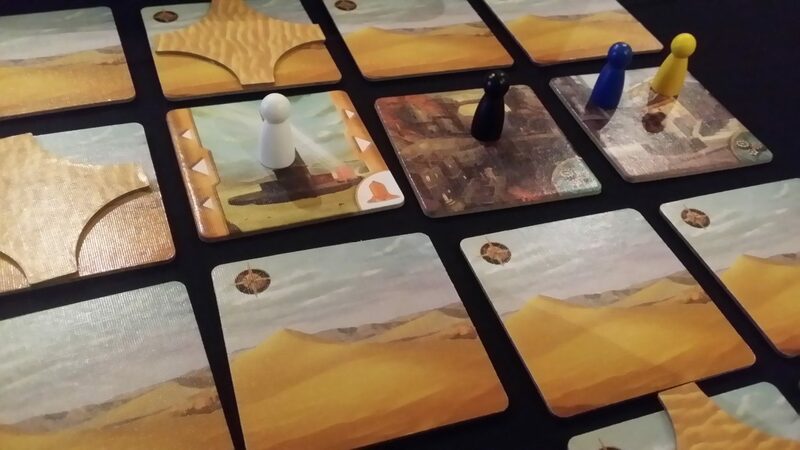 While it does offer an opportunity for tactical decision making, much of the game is also somewhat arbitrary – some games are definitely easier than others, and some are almost impossible. 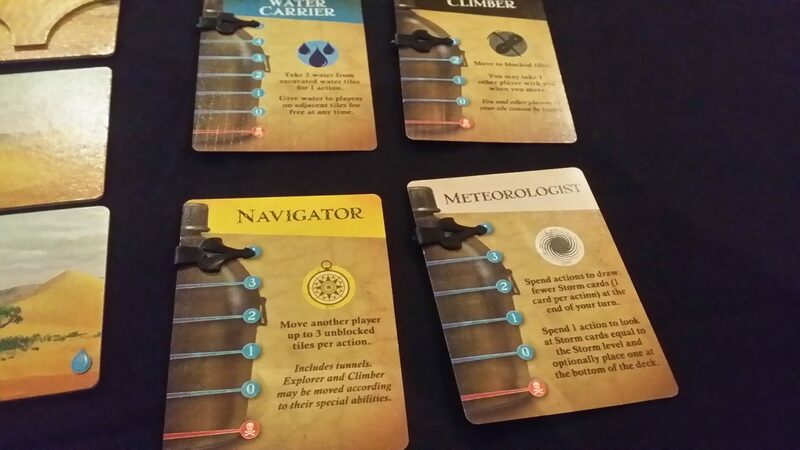 Parts can be distributed throughout the map in ways that make them very difficult to obtain when they are discovered, and the storm deck lacks the equitability of distribution that Pandemic enforces. It’s entirely possible to start with two incidences of the storm picking up, or the sun beating down, even on the easiest levels. There’s a definite possibility of the game unilaterally escalating the difficulty beyond what players may find fun. It’s not quite the same thing as simply starting on a higher level of difficulty (because those cards are at least out of the deck until you shuffle the discard pile back in) but it does seem a little unfair. 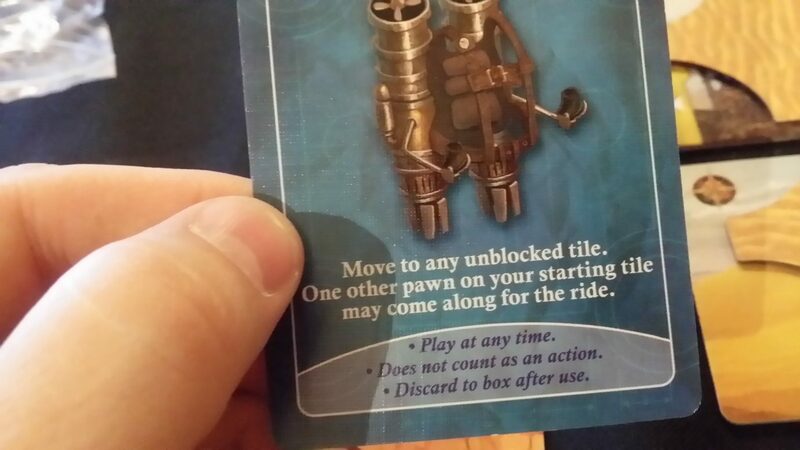 It’s a minor criticism, but I’ve played games where that’s happened and felt discouraged right from the first card. The game is tricky enough. Having said that, it’s another in the family of ‘despair engine’ games so you know what you’re getting into when you open the tin. 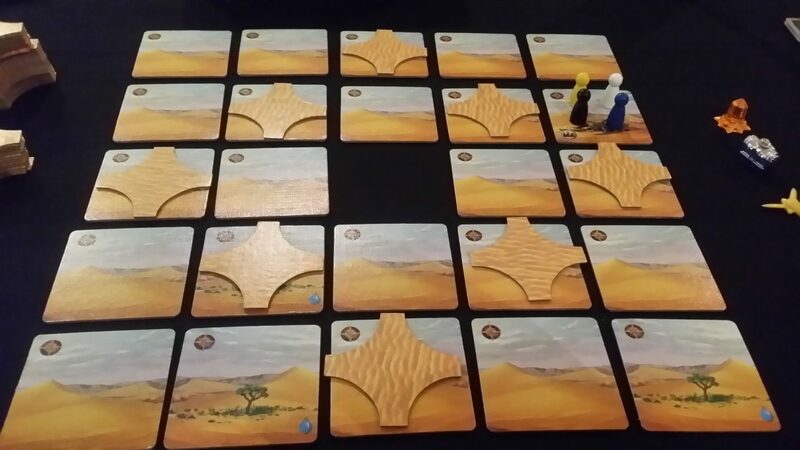 Similarly, as with Pandemic, Forbidden Desert definitely has some roles that are dramatically more useful than others. 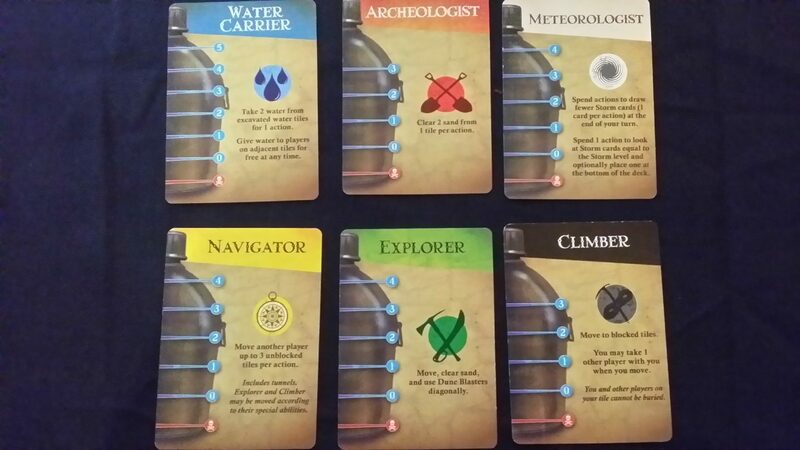 The water carrier and the archaeologist for example can make or break a game – the meteorologist or the explorer – meh, not so much. It’s not that they aren’t useful, it’s just that they’re not vital. You can avoid the randomness of the role allocation by letting people pick the ones they want to play, but then you’ll end up with certain guaranteed power-combos every time. 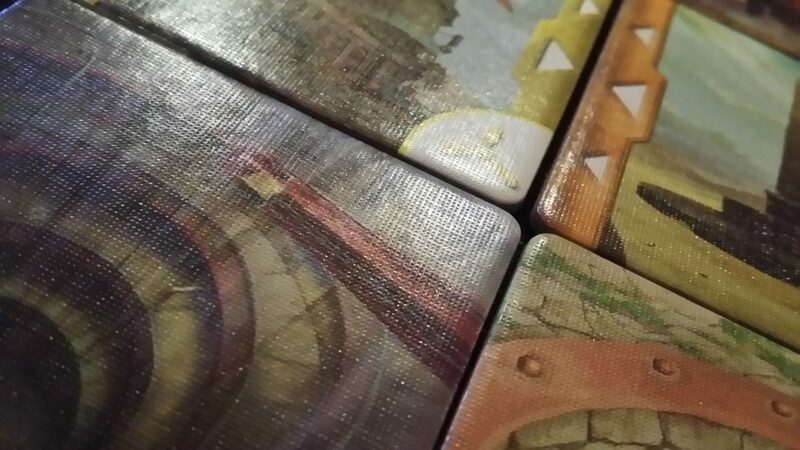 The roles do change the way you need to approach the puzzle of the gameplay, but they also dramatically influence the difficulty of the puzzle. And it’s quite a puzzle. There’s a lot of hidden information in the game, which adds considerably to the sense of unmanageable inevitability. There’s a growing sense of tension as you start to reach the later stages of the storm, because it begins in a seemingly forgiving way. The sand accumulates relatively slowly and it’s easy to say ‘Oh, we don’t need to worry about that, it’s moving away from us’. But that will come back to bite you – if you leave the sand unmanaged, you’ll find yourself desperately dealing with the escalating emergency your own sluggishness has caused. That said, the only real decision you make that has a lot of heft is ‘where do I excavate’ because all of your goals are accomplished by doing that. You deal with running out of water by finding equipment to quickly identify the good oases and facilitating movement to their vicinity. If you want to focus on survivability, the best course of action then is to excavate constantly through play. You make it easier to move around the map by finding tunnels, which are revealed by excavation, and equipment which is also revealed by excavation. If you want to focus on ease of movement in later stages of the game, the best course of action is to excavate constantly through play. So really all you’re doing is working out how best to excavate – I would have liked to have seen more tension in the actions you perform, such as in Pandemic where in order to cure diseases you have to sacrifice freedom of movement, or to share knowledge you have to sacrifice removing cubes. Here it all converges into a simple question of ‘what’s the best way to excavate the largest number of tiles in the shortest period of time’. Don’t get me wrong – that’s still an awful lot of fun. It’s just that it’s not interesting in the same way that decisions in Pandemic are interesting. That said, the fact that you don’t know where to excavate means that the big problem of Pandemic is solved – quarterbacking is all but impossible, because nobody actually knows. Experienced players can outline likely strategies and impact of the storm and such, but they can’t say ‘Going here is objectively better than going where you intended’ because they don’t actually know. It gives more agency to everyone playing if it’s not possible for one person to solve it. It is genuinely collaborative in terms of what people contribute to the play experience, not just in terms of what they contribute to the goal. 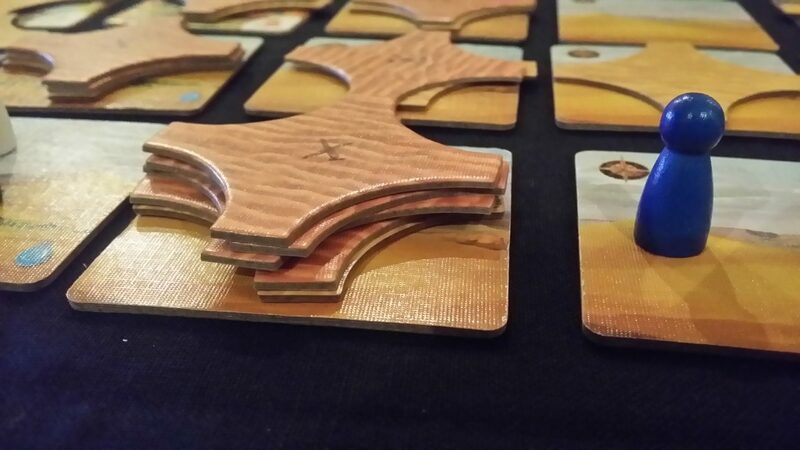 We like Forbidden Desert a lot here at Meeple Like Us – so much so that it has pretty much replaced Forbidden Island in its entirety. It’s not quite as good as Pandemic, but it’s certainly a game that should be on your game shelf given how much fun you get for its low price. Four stars – grab it without hesitation.